I'm delighted to be continuing my membership in this writing community that meets every week for Slice of Life Tuesday. I decided to write this slice in honor of my wedding anniversary. "I now pronounce you man and wife"
Where have all those years gone? My goal is to participate in this challenge (hosted by Kellee and Jen at Teach Mentor Texts) on a regular basis. I love the idea of being an active contributing member of this reading community. Thanks so much to all of you for sharing your reading lives with me. This entire week, I read hardly anything, and then the weekend came, and I managed to get several books read, and really enjoyed all of them. 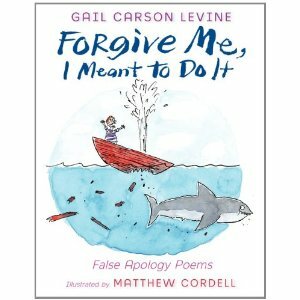 First off, I read Forgive Me, I Meant to Do It: False Apology Poems by Gail Carson Levine. I chuckled my way through the entire book and all the poems. It was fun connecting poems with their original literary context, and it was also quite amusing that Levine played with the sequencing of the book as well. As I read, it seemed to me that she must have had a blast writing these poems. While I'm sure they were all hard work to get just the way she wanted them, Levine infused each poem with great humor. 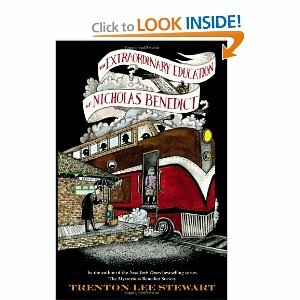 Next came The Extraordinary Education of Nicholas Benedict by Trenton Lee Stewart. I have enjoyed the Mysterious Benedict Society series, and this book was a prequel to that. In it, the reader gets a behind the scenes look at the events that shaped Nicholas Benedict's life. They are really quite telling of things to come. I wrote in my GoodReads account that I originally picked this book up to have something that wouldn't take all my time and attention; I figured because of its length, it would take me awhile to finish. Stewart does such a great job with the pacing of the story and the multiple plot lines, that I just couldn't put it down. 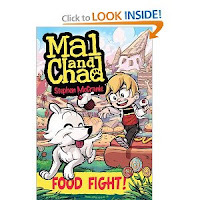 I've had the 2nd book in the Mal and Chad graphic novel series, Food Fight!, for a few weeks, but finally made time to read it. It is very similar to the first book, and I know my students will love it. 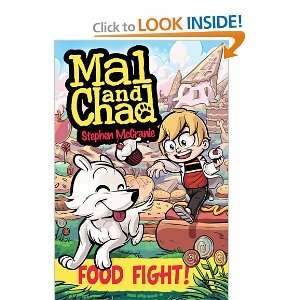 On a personal note, I really wish the other kids in the book wouldn't be so unkind to Mal. I noticed that it really bothered me this time. 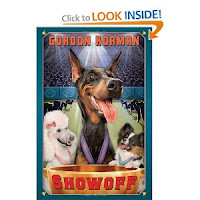 My final book has a back story I'm embarrassed to admit: up until this weekend, I hadn't read any of the Swindle series by Gordon Korman. My blog partner here, Bill, has read/reviewed each one of them, and for some reason, I was just not motivated to do so as well. But I read Showoff (the 4th book in the series), and I enjoyed it immensely. I am predicting that my students will get excited as I highlight these books now. I am planning on rereading the three books that came before so I can get an understanding for the evolution of each character. I enjoyed them all so much in this book. I currently have no specific plans for reading this week, except I may be rereading Divergent to prepare for Insurgent's release next week on May 1. Hope everyone has a great week of reading! 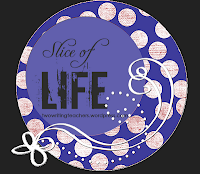 I'm delighted to be continuing my membership in this writing community that meets every week for Slice of Life Tuesday. And even though Stacey and Ruth are taking a well-deserved break from blogging this week, I didn't want to get out of the habit of writing on Tuesdays, so I decided to post a little something today, anyway. My goal is to participate in this challenge (hosted by Kellee and Jen at Teach Mentor Texts) on a pretty regular basis. But like most things I undertake, I do so incrementally. Last week, I got a post up and linked. This week, I plan on not only posting, but spending time reading other linked posts, seeing what friends are reading, and leaving comments for people. I love the idea of being an active contributing member of this reading community. I did not read a great quantity of books this week, but the quality was amazing!! Recently, my adult book club read South of Broad by Pat Conroy. I really enjoyed it, and a friend recommended one of Conroy's books I hadn't read: The Lords of Discipline. All week long, I have managed to read little pieces of Lords of Discipline at a time on my Kindle Fire, but on Saturday evening, I got to a part that I just couldn't stop reading. I had to know how the story was going to end. So I read until 2:30 in the morning. I was exhausted all day Sunday, but it was so worth it. Lords of Discipline was a great inside look at what it is like to attend a military academy as a male, and the different meanings the word "honor" has to the graduates of the academy. I found myself both fascinated and repulsed by the unique initiation rituals performed at the military academy in this book. The academy in this book is based on the Citadel in Charleston, South Carolina (the setting in the book as well). This is a piece of fiction, but I'm betting many of the events run very true to actual events. The other book I read Sunday is more of a middle school / high school read. The title is If Only, and it centers around a 13 year old girl who is trying to work her way through the grieving process. Her mom died very quickly and unexpectedly of cancer one summer. One of my closest friends lost her battle with breast cancer, and she left behind two daughters very similar in age to the girl in the book, so this book felt very personal for me. The question "if only..." is one the main character asks time and time again as she tries to deal with her mother's death. That's it for me. Hope your reading is wonderful this week!!! Two Sundays ago, after 31 days of posting some type of writing daily for the Slice of Life Challenge, I went back and reread what I wrote. I especially focused on all the comments people in my writing community left for me. How blessed I felt to have all of them be part of my writing life, enriching and encouraging me. It made me realize how much I appreciate writing for an audience. I write for myself, but I really appreciate the feedback of others. But, on further reflection, I also realized that some of the posts I wrote during the month of March never reached the audience that inspired them, so I decided it was time to share. I wrote many emails in the past two weeks, sending links of certain posts to people who motivated me to write those pieces, or to people who knew the topics about which I wrote. I sent several posts to my parents, about my grandmother and how my mom was both my reading and knitting mentor. I sent an email to both of my daughters, sharing with them the posts about side view mirrors, drip castles, side by side conversations, and how our reading lives are so incredibly intertwined. I dedicated my book club poem to both of my book clubs and sent them the link to let them know how much they mean to me. My post on how what I have learned in yoga has been translating into my own life was sent to my close friend, who is also my yoga instructor. Her wise words brought that piece to life. I shared my post about Monday Share with both of my language arts classes. They got a big kick out of being featured in my writing. The list goes on and on. I hope that all these people enjoyed knowing how important they are in my life, and that these posts were just one way of paying it forward from me to them. I know I appreciated the opportunity to share specific posts with specific audiences. How fortunate I feel to have words as a medium for expressing my innermost thoughts and feelings. The slices continue each and every Tuesday with Ruth and Stacey at Two Writing Teachers. Please check it out for more great writers and their writing. My goal is to participate in this challenge (hosted by Kellee and Jen at Teach Mentor Texts) on a pretty regular basis. I know that as I've dropped in and read some of the blogs others have written about what they're reading, I get some great ideas for where I can go next with my own reading. And this weekend was full of great reading, so here we go!! I started the long weekend (we weren't in school Friday) by finishing an ARC of Remarkable. What a delightful book that was. I loved the concept of a young girl who was surrounded by gifted parents, siblings, acquaintances, and townsfolk. The big message of this book was that we all have gifts to offer to the world, regardless of how inconsequential -- important message for our students to hear. Some of these books were "destination books" -- they were the reason I traveled to Cover to Cover. Others, like Take Me With You and Kindred Souls, were purchased on the great advice of Beth, one of the incredibly knowledgeable women who work at Cover to Cover. From Friday evening to Sunday evening, I was able to finish Fake Mustache, Humming Room, Take Me With You, and almost finish Kindred Souls. What a great weekend of reading! Fake Mustache by Tom Angleberger was a hoot from start to finish. While I have thoroughly enjoyed his Origami Yoda books, I enjoyed this one even more. Take Me With You is a story set in Italy and revolves around the two main characters just wanting to belong to their family or be adopted by a family who would want them. The idea of belonging is a key component to this book. Kindred Souls is the latest book by Patricia MacLachlan. I love how slowly she moves her plot and action so we can appreciate both the setting and the characters. Another tear jerker for me. But a great book because the language is accessible for many abilities. Humming Room by Ellen Potter was another great recommendation from a tweep. I love Ellen Potter; I currently have many children reading SLOB. The parallels between The Secret Garden and the Humming Room might be a great bridge to get students into a classic like that. I'm so excited to be part of the Monday group! See you all next week! If the rest of the 2012 books I read are anything like the first three of the year, it's going to be a banner year for kids' books! My first 3 reads were The One and Only Ivan by Katherine Applegate, Wonder by R.J. Palacio and The Mighty Miss Malone by Christopher Paul Curtis. I was made aware of The One and Only Ivan when Michael Grant visited Bailey and to ld us his wife was working on another free verse book about a gorilla and an elephant. At the time I was a bit confused by the concept, but when it showed up on the book fair shelves in February I had to read it. I wasn't disappointed. 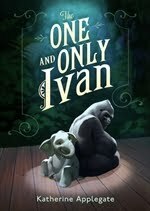 Told in free verse through the eyes of a shopping mall gorilla, The One and Only Ivan is one of those books you love immediately. Ivan's voice is so strong and human that the reader can't help but feel sorry for him and his situation. Ivan has dreams of seeing the outside world that he has watched on the TV in his cage and heard of from his friend Stella the retired circus elephant. When a new baby elephant, Ruby, is introduced to his mall world, Ivan makes a promise he must keep. Amazing! 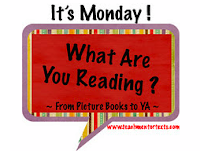 My second read was Wonder by R.J. Palacio which came recommended by...well...EVERYBODY! As much as this one has been written about I really don't need to give any sort of summary, but just lik e Ivan, it will make you sad and happy with every turn of the page. Auggie is such a strong character facing adversity each time he leaves his home that the reader can't help but cheer for him most of the time. However, R.J. Palacio makes him human by giving him flaws. There were times when Auggie felt sorry for himself, deservedly so, but I still got frustrated and thought, "Come on Auggie, you're better than that!" The different perspectives of Auggie make for a read that made my opinions of the people around Auggie change with each chapter. If I was still in the classroom this would be my first read aloud of the year. The discussions about accepting people for who they are, regardless of their shortcomings would be so valuable to setting the tone that it would be time well spent. Finally, I read The Mighty Miss Malone by Christopher Paul Curtis. I'm a huge fan of Bud Not Buddy, one of my favorite Newbery winners so I had to read this one. Curtis takes a minor character, Deza Malone, a smart young lady growing up in Great Depression Michigan a nd develops her and her family by telling of their survival. Deza is proud of her intelligence and doesn't want anything to get in the way of her education. Her parents and older brother are proud of her too and know that she is capable of great things. However, the Great Depression had a way of getting in the way of dreams and the Malone family is no exception to this rule. Out of work, Mr. Malone sees the only way to make things better is for him to leave the family and look for work. Due to a traumatic experience on a fishing trip, his judgement isn't very clear and the family is left in worse circumstances than before and Deza must put her plans on hold. As always, Christopher Paul Curtis mixes humor, compassion and wonderful characters to tell an engaging story. All three stories have strong main characters that require the reader to cheer them on and hope for the best all the time knowing that things will get tough before they get better. Any of these will make excellent Grand Discussion books for next year but I'm afraid to commit because I can't wait to see what else 2012 will have to offer! I know I said that I would post about the work portion of our trip to San Diego on Tuesday, but I had to let Karen tell about her experience with hot yoga. Me personally, I prefer a hot pretzel, but each to his own I guess. Just to catch you up, my friend and colleague Maria at Teaching in the 21st Century were invited by the good folks at the National Center for Family Literacy to present how we use their Wonderopolis website in our classrooms. We were part of a panel that included 3 other educators including one public librarian, more on that later. After enjoying the city we had some responsibilities to fulfill on Sunday, one of them was the opening general session that included some very inspirational speakers. I was moved by the story of Jennifer Navarro Burns, a single mom from Long Beach that knew education was the only way to give her son the life she wished she had as a child growing up in Columbia. She used the ESL services provided by the Long Beach Family Literacy program, became proficient in English and began studying at Long Beach City College. From there she worked in a dentist office and decided to continue her college studies at Cerritos College to become a dental hygienist so she would have more time with her son Bryant a happy, successful first grader. 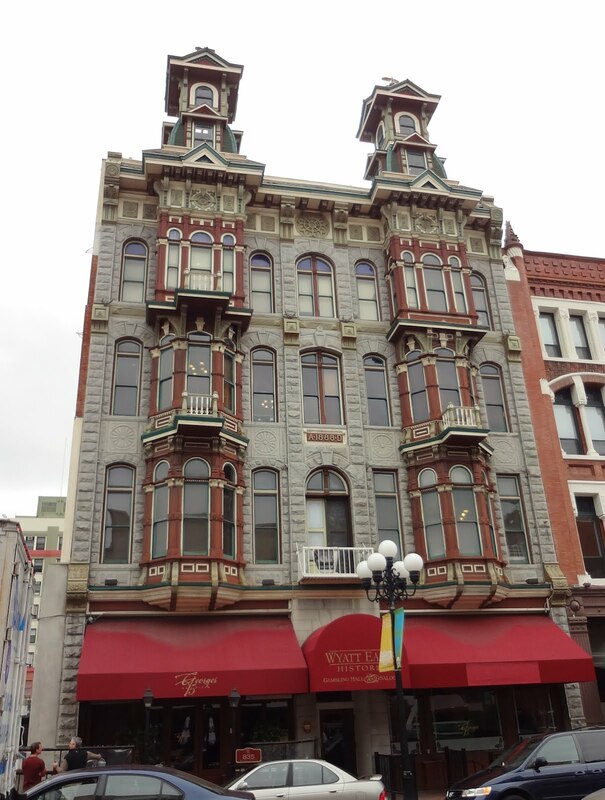 I must admit, before attending the conference, I didn't really know much about what NCFL did. While at the conference I heard countless stories of people in the trenches working with little or no budgets, with people who are struggling to make ends meet, but understanding that education is the ticket to a better life for them and their families. On Monday we presented. We had 30 or 40 people attend our session. Our panel was made up of people who had received Wonderopolis mini grants from Better World Books. Maria and I were joined by 5th grade teacher Ashley Cripps from South Carolina; Julia Dweck, a multi talented gifted specialist from Pennsylvania and Aime Thomas, a public librarian from Brownsburg, Indiana. Each of us took about 15 minutes to present how we were using Wonderopolis in our classrooms or libraries and I was honored and humbled to be included in such a smart group of people. Quite honestly I came away with several ideas that I'm currently trying to implement into my library, so I'm sure the others in the room walked away with plenty of good ideas too. That evening we attended the NCFL banquet, where we sat as a panel at a reserved table very near the front. They made us feel very important, but I must say that there was a lot of silverware around that plate, fortunately my new friends Heike and Donna from NCFL helped keep me straight. After dinner I was once again moved by another alum of programs sponsored by NCFL, Henry Hildreth, Jr. Henry is a proud Navajo from New Mexico who is also a veteran of Iraq. When he returned from his tour of duty he set his sights on becoming a better family man and especially father to his son Adam. He and Adam began participating in the FACE program, Family and Child Education. It's an exciting program in which the parents and children go to school together. For part of the day the kids do the preschool thing while the parents work on GEDs or other further education opportunities. The other part of the day they work together and learn ways to increase literacy in their homes, not only to help the children but the parents as well. Henry was very obviously a proud father, Adam who is ready for kindergarten this fall. It saddened Henry that he and Adam wouldn't be attending school together any more, but he will still be attending school, continuing his education in college. There wasn't a dry eye in the house when Adam joined his father on stage, awesome! On Tuesday we packed up and flew home to Ohio. It was an amazing week of fun, learning and inspiration. Maria is blogging about the conference today too, so check out Teaching in the 21st Century for her views on our week in San Diego. A friend of mine has been very serious the last few months about being healthier, and one of the ways she is accomplishing this is through yoga. I have been taking yoga classes at another studio for the same time-frame, and love the zen feeling I get from stretching, breathing, and posing, but thought it might be fun to take a yoga class with her. I decided going to her yoga class would accomplish three things: I would be able to compare the two classes, I would get a good workout, and I would be a supportive friend. It was made very clear to me beforehand that this was a "hot" yoga class, and I needed to come prepared with plenty of fluids, a sleeveless top, and a towel to soak up all the sweat. From the minute I walked in the studio, it was apparent that I hadn't been steered wrong. All the heaters were on, going full blast, another class had just wrapped up, and the studio was so hot and humid, it was hard to breathe. But since we got there early, I got to sit on my mat, chat with friends, and become acclimated to the heat and humidity. The instructor came to her mat, and started the class. In the beginning, as we assumed easy poses and thought about our breathing, I was good, even though breathing was difficult in the oppressive heat. But then the instructor started to "flow" through poses, none of which were simple for me. I could do many of them, but not at the pace and the stamina of the rest of the class. I was fine with that; it wasn't a contest for me, but the harder the "flow" became, the more I sweated, and the more I sweated, the more difficult it was to maintain good breathing techniques. At several points, the heat become so oppressive, I actually thought I was going to be ill. But here's the thing -- I didn't. And even though I couldn't do every single pose, or if I did get the pose, I wasn't able to hold it for the duration, I kept my body moving the whole time. It wasn't pretty, but I made it through the entire class. By the end of the hour-plus, sweat (definitely not perspiration) was pouring off my body. I couldn't towel myself off fast enough, or drink enough fluids. When I walked into my house afterward, my husband asked me if I had been running through sprinklers; I was that gross and wet. But what a great learning experience for me. Sometimes when things get too difficult, it can be easy to give up and just quit. But I didn't do that, and except for the slight nausea, I had an exercise high after the class (actually, I continue to have the high even as I am composing this post). I pushed some limits for myself athletically and that helped attune my mind to my body's capabilities. And more importantly, I accomplished all of this with support from the two friends with whom I went. I'm going to chalk this experience up as win! So yes, I survived hot yoga, even if just barely. I'm thrilled to be joining the friends I met while doing the Slice of Life Challenge, and am looking forward to meeting even more folks on Slice Tuesdays. As always, thanks to Stacey and Ruth at Two Writing Teachers for hosting Slice Tuesday! My colleague Maria from Teaching in the 21st Century and I were invited to present at the national conference for the National Center for Family Literacy in San Diego last week. Since we were on spring break we decided to go out a couple days early to check out the city and have some fun. We left the warm March climate of central Ohio, seriously it was 80 degrees when we left, and flew into the cool climes of San Diego, low 60s. Who would have thought it! On our arrival we walked along the San Diego harbor and admired the many boats docked there, planned our days of fun before the conference began and enjoyed some really great food. Highlights included a whale watch, we saw three gray whales swimming, several dolphins and a whole lot of seals. We also got sunburned because we weren't anticipating the sky clearing and a beautiful sunny afternoon. We spent a morning on Coronado Island and visited the Hotel Del Coronado which op ened in 1888. As we strolled the corridors you could just sense the history and picture Bing Crosby, Frank Sinatra or Marilyn Monroe enjoying this classic hotel back in the day. In fact, the movie Some Like it Hot was filmed on location at the Coronado and photos of Marilyn Monroe are on display in the history hall. Back on the mainland we walked past the Midway, a gigantic aircraft carrier permanently located in San Diego Harbor and visited a memorial to Bob Hope and all he did to entertain our troops. As you walk into the site, you can hear a recording of Mr. Hope giving o ne of h is famous monologues in his one of a kind style. It was very moving and the three of us, Maria, her husband Tom and I all reminisced about watching those TV specials as kids. I'm not sure today's kid can relate to all of that and I think they're really missing out on something important. 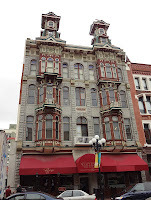 For lunch one day we visited the Gaslight district, full of restaurants and pubs where w e enjoyed one of the best burgers I've ever eaten at Nicky Rottens and saw Wyatt Earpps' place on 5th Avenue. We took the train to Old Town to see what San Diego looked like in the beginning and enjoyed some delicious Mexican food. For two days we rode the city buses and trains everywhere and stuffed a lot of touring into a short time. On Sunday the conference started and Maria and I had to go to work. I'll share more about that tomorrow.